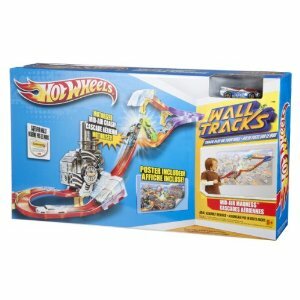 Back in October I reviewed the wonderful Hot Wheels Wall Track toy. My children abdolutely loved it so I was thrilled when asked to review the brand new Mid-Air Madness track! Just like last time we found the track very easy to assemble and attach to the wall. It’s also a little more compact in width making it perfect for smaller bedrooms. 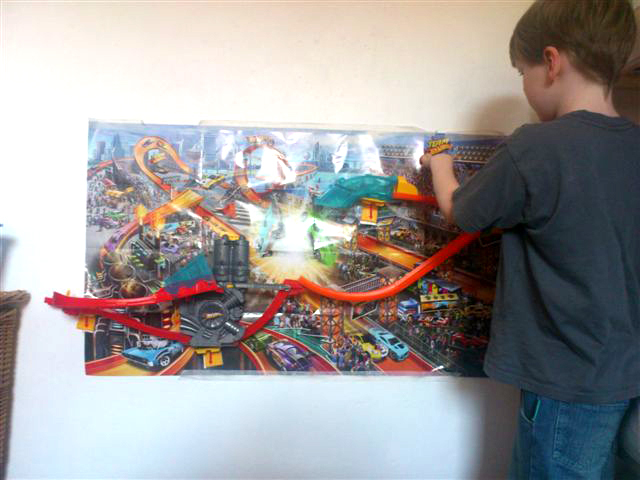 The instuctions also doubled as a background poster which definitely enhanced the fun as far as my kids were concerned. Having kept the kids at bay during construction we let them loose on their new toy. They absolutely adored it! Cars wizz around the track at speed, flying through the air before landing with ease and carrying on their whirlwind journey round and round. The track did require large D batteries which unfortunately were not included, this caused a slight delay while we popped to the shops. We also found that they drained the batteries rather quickly, so make sure you have plenty on standby if you don’t want unhappy faces all around. On day two of the wall track one piece did keep disconnecting from the wall due to the sheer force as the cars landed. This was rather annoying to me but the kids seemed unfazed and just kept reconnecting it and carrying on. Another day on and a piece fell off the wall, I rather think this was down to us perhaps not attaching the wall strips firmly enough. Unfortunately two patches of wall paint disappeared along with the track pieces, this did not happen with our first Wall Track set, so I am unsure if it was my walls that caused the problem or the track. Once we had reattached the track it stayed put, with no further falls or disconnections. The best advice would be, make sure it’s really well stuck the first time! Considering how happy all my children are (not just the boys) I would definitely recommend it.It seems to provide hours of fascination and fun. I would like to see the batteries last a little longer. 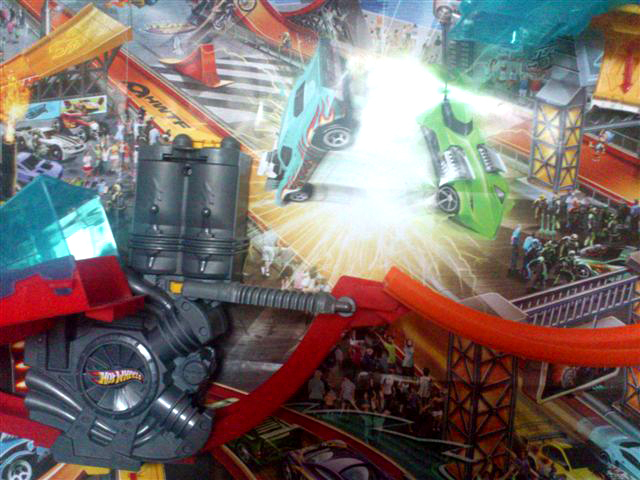 It’s also a fairly audible toy, akin to a typical fan noise so don’t attach it in the TV room. Available at all good toy retailers online and instore. Further details available at the Hot Wheels website.